The Ventura County-based Triunfo Sanitation District has serviced customers in southeastern Ventura County as a Sanitation District for over 50 years. 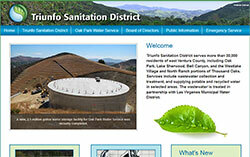 It was established in 1963 to help residents of Ventura County with Water and Sanitation-related services. Representing over 30,000 people in Oak Park, Lake Sherwood, Bell Canyon, and the Westlake Village and North Ranch portions of Thousand Oaks, this agency works to improve water quality and monitor the health of our wastewater. theAgency was looking for a website as dramatic as the lands it represents and SOHO was engaged provide the technical prowess needed to deliver it. The Ventura County Community for a Clean Watershed program was established to help residents understand how to respect and protect their watersheds. 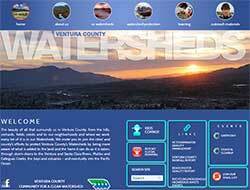 Representing the ten cities of Ventura County and the County itself, this agency works to improve stormwater quality and monitor the health of our watersheds. The agency was looking for a website as dramatic as the lands it represents and SOHO was engaged provide the technical prowess needed to deliver it.